Just a quick post today, featuring my favourite swap find to date! Here's my latest craft project for you all. I found this medium brown stretch cotton on sale at the market for £1.50 a metre, and thought it'd make a nice understated circle dress. I used my old faithful vogue pattern (V8615) to make it, this time adding 3/4 length sleeves (a step I've always skipped before). I find the sleeves a bit tight on me, so some upsizing will be needed if I make this again with sleeves. For £4.50 total cost though, it's a perfectly functional dress for work and play. Hey strangers! The past couple of weeks have been busy with job interviews, cooking and zine making, and sadly a little low on the outfit front. Hopefully I'll be a little more active again now. In other news, I'm getting really excited about putting the zine I'm making together. I've been having fun with bad art and trying out some sewing methods for it. I'm still seeking submissions, so if anyone has any fat/crafty/DIY ideas to put forward then drop me an email. All the details are here, and submissions close on the 30th November (though there's certainly some flexibility there). A very badly lit casual outfit for you all today! I scored this button up shirt from the fat clothes swap in October - button up shirts and blouses are perfect everyday wear for me, and jumpers and skinnies make them perfect casual attire. In other news, I er, clearly need to take photographs away from light bulbs in the future. It came out well for a first try - I ended up making it too large and had to take it in a fair bit, but that might be because of the super stretchy fabric. However, I'll DEFINITELY be making it again (Burda suggest contrast pockets, with sounds great!) in a less conservative pattern. I was window shopping recently on H&M's website, and was pleasantly surprised to notice that a few pieces of the Inclusive range had some pretty hefty reductions. I wasn't keen on the range on it's release, but I did like a few pieces - this skirt and this bodysuit - both still reduced to £7.99 online. I ordered both (though sadly the body didn't work - not surprising, as I've yet to find one made for my 5'9" frame). I ended up having to size up to a size 26 for the skirt (this range runs so small! Size up at least one, probably two sizes, from your average). The ordering and exchanging process was pretty frustrating - to my knowledge, there is no sizing information online for this range, and it took about six weeks and several angry emails to get my exchange sorted! The skirt itself is fantastic, and I'm impressed with the length and fullness of it, but I'm not sure I'd go through such hassle to get an item of clothing again. Anyway, it's here now, and I debuted it to go gaming with some friends. I teamed it with some basic pieces to make it a feature of the outfit. I spent yesterday at Golden Acre Park in Leeds, enjoying Autumn at it's fullest! It was a bright but cold day, so I figured I'd do a blogger cliche and take my picture amidst the fallen leaves. It was a quiet day so luckily I managed to avoid feeling incredibly awkward in the process of doing so. Yay! I'm fairly certain that October didn't really call for a crop top, but I'm reluctant to give them up quite yet. I wore this to a gig the other week. The skirt was from Evans (back when they weren't scared of mini skirts) and is the best mini I own. Make It Work is a DIY fat radical craft zine, focusing on strategies for resistance, tutorials and craft projects for fellow awesome fats. “Make It Work” has been a mantra within fatshion communities since I can remember, and I’m interested in exploring it as a radical premise of fat positive politics. Fat people have and have always had very limited options in ready-made clothing, and, whilst retailers are starting to produce more on trend pieces, the process is slow and in the meantime, we have to come up with our own radical alternatives – whether it’s making clothes, thrifting, altering clothes or making straight sizes work for us. I want this zine to be about sharing the resources, skills and knowledge that we’ve gained, and for it to provide strategies for people to move forward with. - Craft and fatshion related personal pieces. - Organising fatshion events – clothes swap, DIY fashion shows, selling on etsy and so on. - Sewing and crafting on a budget – how to do it, where to find cheap supplies, etc. - Thrifting tips, shopping guides and etsy recommendations for fat positive sellers. - Strategies for shopping – how do you find the pieces that you want if they aren’t immediately available? Shopping in straight size stores, vintage shopping, resource guides. - Dressing queer as a fat person – how does being fat impact your choices? How do dominant aesthetics limit your choices, how do you resist them, and how does your sense of dress interact with these dominant aesthetics? - Resources for trans and gender queer identified people. - Letters to high street retailers, commentary on outsizing, plus size ranges and any other rants. - Pieces on fatshion role models. - Illustrations (that look good in black and white and are photocopiable! ), comics, visual art of any kind. 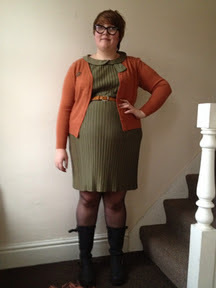 - Critiques and criticisms of fatshion – how could we be more inclusive? Who do you want to see blogging? Email any ideas, contributions and questions through to me at fattyunbound@gmail.com. I’m going to set a preliminary deadline of 30th November for submitting, though that will probably slide and if anyone can’t make that, let me know and I’ll try and set some space aside for you. I started thinking about doing something like this after some conversations with Lauren over the weekend, and after some debates that have recently been circulating around twitter and tumblr. I’ve been following fatshion blogs and communities since I discovered the Fatshionista livejournal community in 2007, and I’m really interested in how the community has evolved and shifted in those years. For me, Fatshionista was an amazing space, because it focused on fashion from a radically, politically engaged perspective and because it didn’t permit diet talk of any kind. I’m not saying that it was without problems, but at its peak it was a fantastic entrance point for anyone starting to re-think their body. Now that the community has dwindled, and most people blog instead, this sense of safe space doesn’t really exist anymore, because, whilst there is still a community of sorts, we each control our own spaces. Just because someone runs a plus size fashion blog doesn’t mean that they are fat positive, that the blog won’t involve diet talk or that they engage with politics in remotely the same way that I do. I’m used to fatshion being half about body politics, and half about clothes – however, as different people have entered the community from different backgrounds, the focus has shifted away from politics. I recognise everyone’s right to bodily autonomy, and I’m not going to argue with anyone losing weight – that’s your choice, just as much as mine was to stop dieting. We all know what’s best for us individually. However, I can’t pretend that I’m not often nostalgic for when fatshion always came with a dose of radical fat acceptance politics. Instead of just ranting about my issues here, I thought I’d try and create something new that would bring some of these resources back into focus. This past week, I've been thinking about staple winter outfits. This outfit is probably all of my favourite staples in one outfits - button up blouses, high waisted skirt, round neck jumper and my trusty docs. It really helps with dark mornings to be able to rely on a formula like this, instead of trying to be super stylish every day of the week. After a bike-less hiatus in Brighton, I've finally been able to start cycling again now that I'm back in Leeds. I'm still getting used to what I can and cannot wear on it. This outfit is probably an errand running staple - great for cycling through rain and not getting distracted by my clothes. The boots are Rocketdog Nokouts, bought recently on eBay after I discovered that they still existed! I had these boots when I was in uni (though in brown) and wore them to death. Since they went beyond repair, I've never found another pair of boots to feel the same about - my calves are too wide for most styles, and normally I just end up with a pair from Evans that I don't feel strongly about - so when I discovered that these still existed, I was ecstatic! They retail at about £65-70 online, but I was able to track down a nearly new pair for a bit less. They're available from IShoe for anyone else interested. They fit my wide size 8 and large calves with room to spare. I took the day as an opportunity to wear a vintage housecoat I picked up in Portland over the summer, which is the stuff of garish colour lovers' dreams. I sewed up the front to make it a dress instead so it could see more daylight! And a last close up of the serious business awesome badge that the lovely Donna made for me, which had to come out for the event! Oh, and my new fancy glasses, which are from Lensway if anyone is interested.